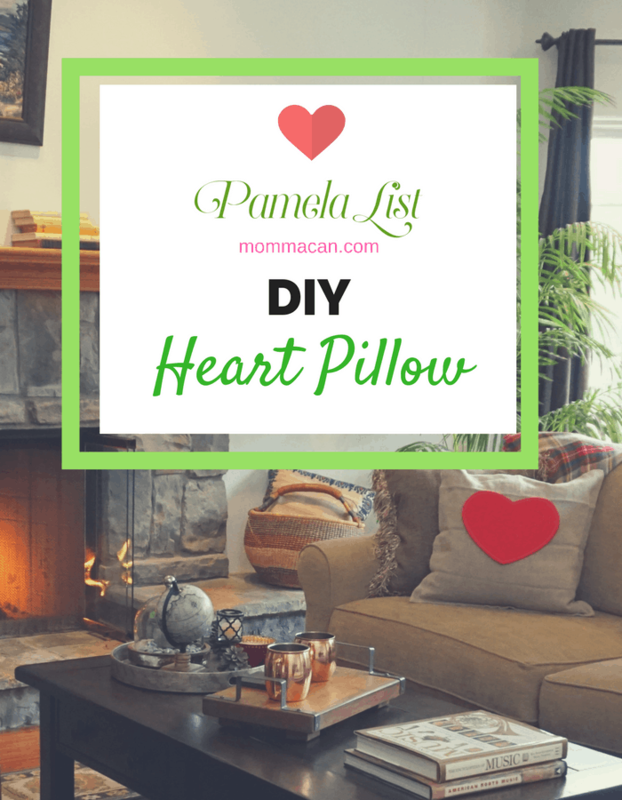 I am so excited to share with you all my very first DIY project a DIY Heart Pillow! A project I thought even the busiest of moms and caregivers could appreciate and make at home! You can even allow the little ones to help, it is just so simple and fast! One of my wishes for the blog was to create and share super simple recipes, organizing hacks and super simple DIY crafts along with simple decorating tips. This is the first DIY for just US, the SUPER BUSY HOMEMAKER! Out of all the pillows in the world I thought a heart pillow would mean so much during the month of not only Valentine’s Day out of love for all women who have lived with heart disease with prayerful recognition of those who have lost their lives and also with a special love for those women who share their stories like my friend Diane’s daughter Karen. Here is her story. When I look at these Bright Red Cheery Heart Pillows, I can’t help but feel thankful for the health of my own family. The red really pops and will look wonderful for this month of love and reflection. 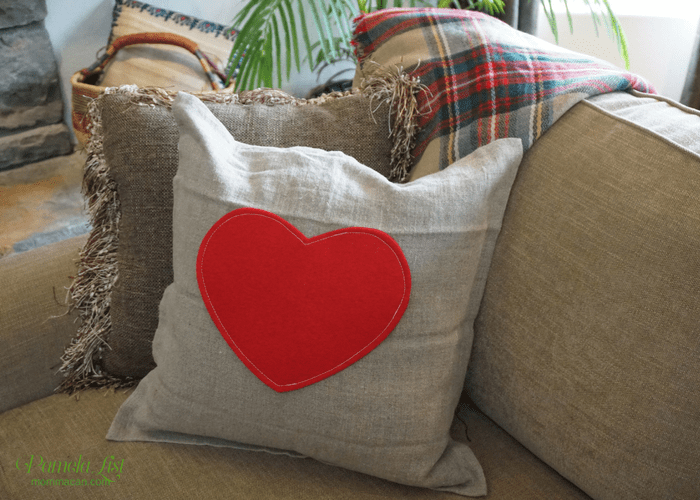 However, the heart is removable and can be replaced with a wonderful Easter or Spring emblem later, and that is why I loved making this DIY pillow! 2 -20″ x 20″ Square Pillow Inserts or any 20″x20 “ pillows you have on hand. 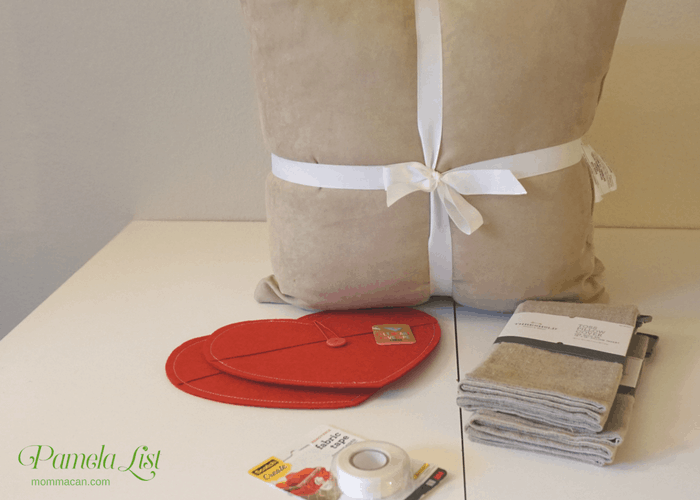 Two red felt hearts or any fabric or shape to decorate your pillow! The sky is the limit! How about a four leave clover for Spring? Directions: Psst. This craft took about 10 minutes. Insert pillows into pillow covers. Fluff pillows until corners are full looking, kind of like putting the duvet on the down comforter. Place Heart Shape Felt face down and adhere pieces of removable fabric tape firmly around the edges and in the middle, taking care to keep the tape hidden. You will have to move the tape covers front and back. Place heart in the middle of the pillow and press down firmly until it sticks. 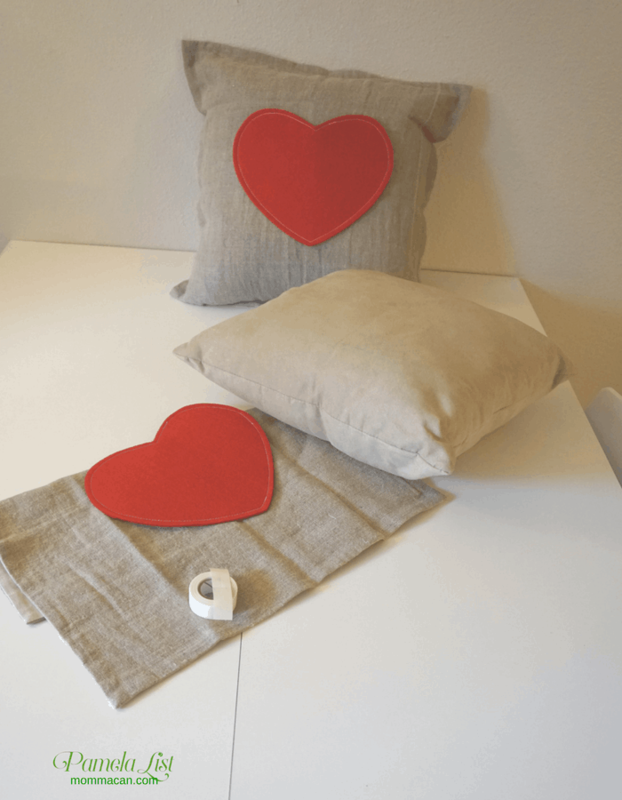 The heart-shaped felt will remove easily, so these pillows will not be ideal for pillow fights or tug-of-war. Make sure the hearts are even! Enjoy your super cute pillow! I hope you enjoyed our very first SUPER SIMPLE DIY! I can’t wait to show you our next ridiculously doable DIY or Organizing project. After all, we busy homemakers need to have fun and get crafty even if we just have 10 minutes! Very cute and I love that it can change with the seasons! Hey Pam: This is brilliantly simple you can have clover leaf, a bunny, a carrot, a daffodil, the list goes on and on. This is so cute and an excellent idea. I love the idea of a removable piece to change the pillow up for the seasons. I just need to find something flat for Mardi Gras! 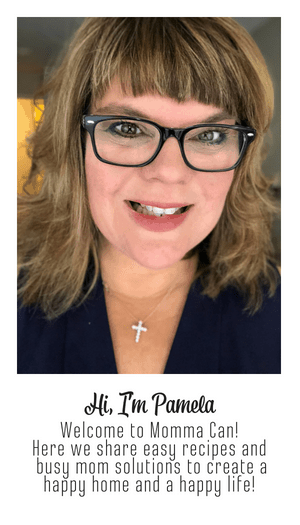 Pam, thanks so much for hosting! My favorite part of this craft is that you can keep changing the decoration on the pillow. Burlap is such a great neutral background. Great job and welcome to the DIY world!! Thanks for linking up at my Valentine’s Day celebration. This looks lovely and I hope you had a very Happy Valentine’s Day. Feel free to stop by again and link up your favorite wreath project this week at my Waste Not Wednesday Week 38 link party.